How long would you wait on hold? For many people, any amount of time is too long. In fact, a survey indicated about one third of people said they’re unwilling to wait on the line, and 27.6% said they would hold for 1 minute. A lack of patience is associated with age groups. As the below infographic shows, younger individuals are less likely to wait than their older counterparts, proving the increasing sense of immediacy will put growing pressure on businesses who aren’t responsive. 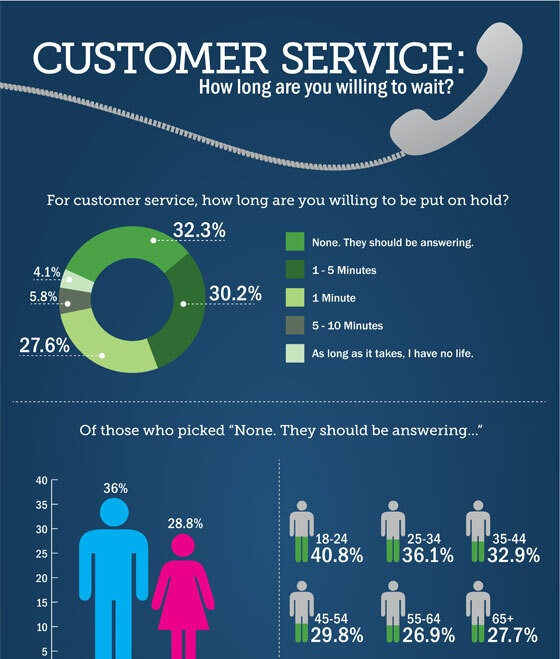 Additional data shows 60% of customers will hang up after 60 seconds, with about 32% that will actually call back. When you do the math, that is a decent amount of potential revenue that is lost from not booking new appointments. And when considering the cost of a lead (or the marketing cost required to get the patient to call your practice) runs at a minimum of $32-50 per patient, the practice is actually throwing away a significant amount of money. Practices who allow phone calls to hold will continue to lose out. Mobile phone calls to businesses are predicted to surge to around 162 billion by 2019, more than double the amount businesses received in 2014. In the age where you can schedule an appointment online, this may be hard to believe. The majority of mobile users call a business when they’re in the purchase phase of the buying cycle because their find it faster to get a quick answer or they simply want to talk to a human being. The need to talk with a live person increases when it comes to making expensive, or high-risk decisions (ahem, like a medical procedure). Furthermore, now that online technology integrates seamlessly with mobile communications, consumers can more quickly and easily “click to call” based on search results. This isn’t new news. Patients have become increasingly impatient and more demanding of exceptional customer service for decades. Yet, a big reason practices won’t improve their phone handling: they don’t know they need to. They are unaware of how often they put calls on hold. They don’t know how long new leads are waiting on the line. They aren’t tracking their calls and they aren’t monitoring performance. A simple practice assessment is the first step to understanding where your practice is falling short. OptiCall offers free phone assessments that provide actionable information you can use to identify gaps in your phone processes. From there, you can train your staff and improve workflows. OptiCall’s First Contact program has also been a go-to solution for many practices who are doing away with hold times and missed calls. We serve as an extension of your staff, answering phones for you with a focus on converting leads to booked appointments. Consumers will continue to demand more personalized customer service at the click of a button, pressuring businesses to adapt in order to be successful. The question is, will you be one of them?